After the birth of 2 kids, not much has changed in the five years between them when it comes to baby products that I love and trust. The following products have been mentioned in the early days of this blog, when my first, Ava-Sol was a baby. It may come as a surprise but when she outgrew the baby stage, I packed them all away for baby # 2. I don't think my plan was to wait five years to pull them out again. ... And in those five years, don't ask the number of times, I was harassed to 'bring the boy'! Not only was the expectation that I could not just stop at one child, but my parents' sentiment was "have your kids back to back so you could just pass on from one to the next, and get over that baby stage!" Basically, the belief was that it would be cost effective too. I got the point and to rectify that, I simply packed everything, neatly away. My advice though, do have your second child at your own timing or pace, although be mindful of getting older. Five years later, who knew getting the stroller in and out of the car would be so painstakingly heavy? Well it is. And my son, Nikail is now 8 months old and I am ready to toss the diaper bag, I have to carry in addition to my usual everyday bag! LOL. Before I had children, I could not imagine a home with toys. 'Though toys come with kids. So it's about being practical and setting limits. I do not do Toys R Us, I leave that for grandparents. If I say, "No, that is expensive!" or "no, you don't need that!" my daughter listens (my son is in training). She amazed my dad one day on a visit to the toy store, when she told him after 2 / 3 items, "Grandpa, I have enough!" Toys are lovely in the store, all packaged nicely and orderly. In a home, they're out of packages, a million little pieces, scattered and possibly found all over the place. My advice, get them organized and start teaching kids to be responsible about putting their toys / books neatly away. Sign up online for sales and coupons from your favorite baby /children stores. Buy children's clothes out of season, during end of season SALES. Stick to 'SALE' signs whether they may not be your child's current clothing size. The trick is to always buy larger sizes (at least two sizes bigger) than your kids, they will eventually grow into them. Be open to shopping for girls in the boys department too. Whether you're having a boy or girl, buy products that can be used for the next child. My son did not need a thing, except for clothes and diapers by the time he came along. I kept EVERYTHING. There are still baby items that I purchased for my first and I think, "I should not have bought that in pink!" Buy car seats, strollers, feeding chairs, baby clothes, bedding, etc, anything you do not mind passing along in colors that work for either boy / girl children. In order for stuff to be worth saving, it means taking care of it even while in use. For example, if I did not constantly clean my daughter's feeding high chair when she used it, I probably would not have kept it for my son. But because I am almost OCD on cleanliness, everything I used during my daughter's time was in GREAT condition by the time my son came along. It's all well and good to save items, but it's most important to have them properly stored. Neither do you want to see them, especially bulky baby items. For starters, remove batteries from products such as lullabies and toys. Wash and clean everything. Use bleach to kill germs. Neatly fold and pack away. If you take things down or unscrew anything, put screws in a bag and tape it to the item. Do label items so you know what you have stored. This also makes things easy to find when it comes to the second child, as they progress. 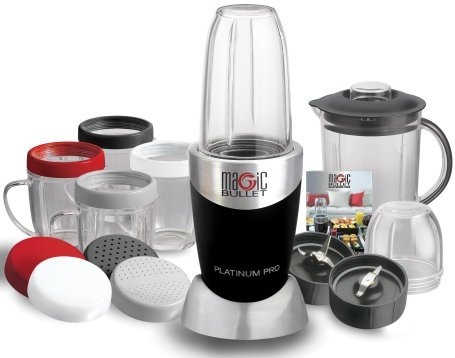 Magic Bullet Blender creates meals, snacks, desserts, party time favorites and does virtually any job in the kitchen all in 10 seconds or less - with no mess and no fuss. Yet it takes up no more space on your counter than a coffee mug. It's so versatile and so easy you'll use it every single day of the week. Here's the magic bullet blender's many uses. 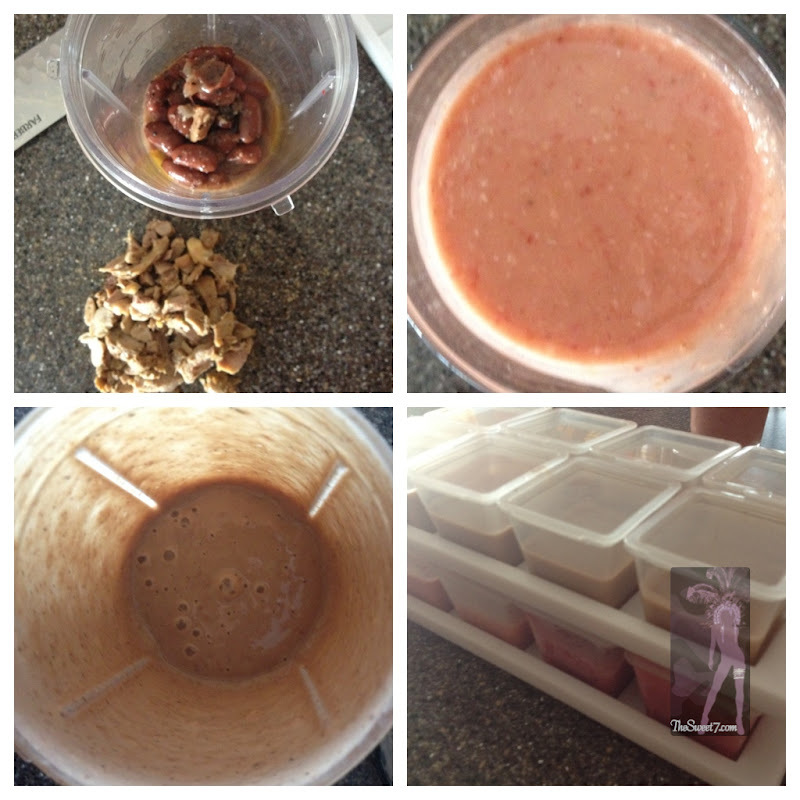 The Sweet 7: I used to The Magic Bullet to make home made baby food for my daughter. ... And since then, this is probably my most used kitchen appliance. I make smoothies all the time and I can make a mean bean dip with it too. I store it in a cupboard and pull it out when needed. Washing it is so much more convenient than dealing with a blender. And because of its size, I tend to make the ideal drink quantity. 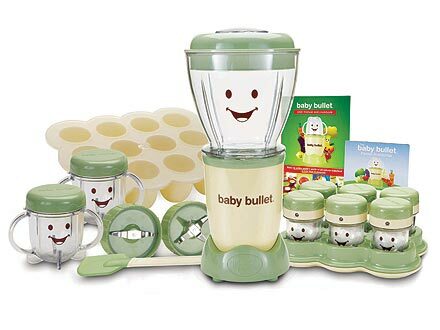 ... and if you'd prefer to give this as a gift, consider The Original Baby Bullet, just to be cute but if thinking of a long term gift ... simply stick with the Magic Bullet above. The Sweet 7: Good nutrition just got easier. All the healthy benefits of homemade baby food, plus the convenience of pre-made jarred food. When you make baby fresh homemade entrees, you can freeze extra portions for future meals. Each snap-lid container holds a perfect one-ounce portion that's ideal for busy days and meals-on-the-go. Travels well from freezer to microwave to dishwasher. I used the 1oz size with my daughter. When she outgrew baby food, I stored them in a cupboard drawer and recently, pulled them out since my son is starting to eat baby food. What I have noticed, the newer version of this product comes in 3 sizes as your baby grows which is rather helpful and convenient. Here's a look at some stuff I've made with my Magic Bullet, Chicken and beans (seen left) and a fruit smoothie (seen right) and then poured into my cubes and placed in the freezer. Baby Safe Feeder Starter Kit - The "original" patented Baby Safe Feeder™ allows you to feed your little one fresh foods of your choice without the added sugars, salts, spices or preservatives. The soft mesh bag is soothing to baby’s gums. Fill with ice, frozen fruits and our feeder becomes the perfect soothing teether. For ages 5 months to approximately 21 months. Easy, convenient and economical. NO BPA, PVC (not even in our packaging), Latex or Phthalates. We use only FDA approved materials. Made in the USA. Don't forget to purchase extra bags. The Baby Safe Feeder was invented by a dad whose baby nearly died choking on a biscuit. The Sweet 7 - Give baby fresh food without risk of choking. 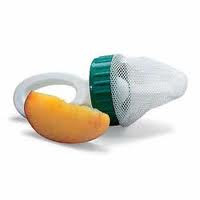 The mesh feeder allows you to feed baby fresh fruits, vegetables, and meats safely (while teaching baby how to chew). My daughter was and still is such a dainty eater. My son recently started eating with this ... and if I pull it to refill it with usually grapes, he will growl and fuss. 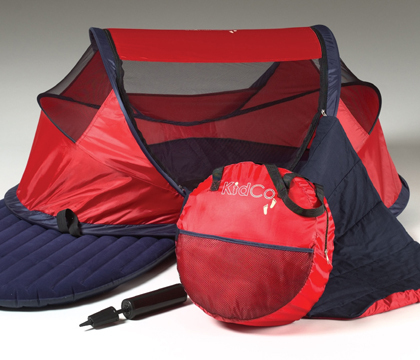 Kidco PeaPod is the travel bed that does it all for the on-the-go parent! 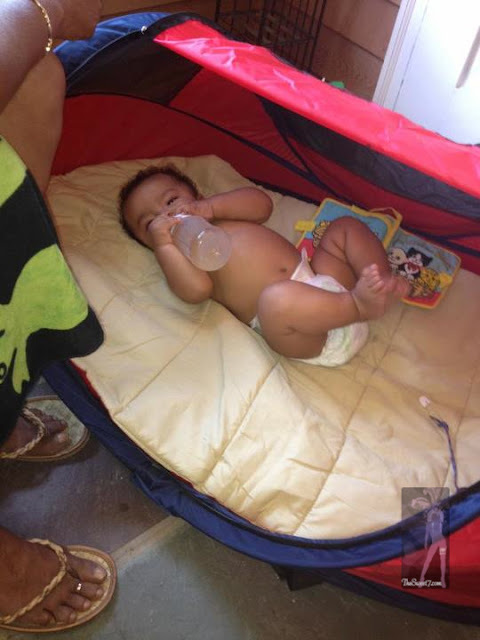 The inflatable air mattress helps protect baby from cold, damp floors while providing a comforting place to sleep. Great for outdoors because of its UV protection and wind screens. Zippered panels allow parents quick and easy access to baby from virtually any angle. The slick, easy to fold design makes it ideal for storage and use anytime. The Sweet 7: Easy to pack, so this travels with me. I've used it in Vermont outdoors and St.Lucia on the beach. Great for outdoors, cause the zippered panel keeps out mosquitos. ... And perfect material to just dust off sand. My son chillin' and his granny's ring on her toes! LOL! Both my children have been travelers from the age of 3months, here is my Airports, Planes and Baby post to make your life easy while travelling with a baby. 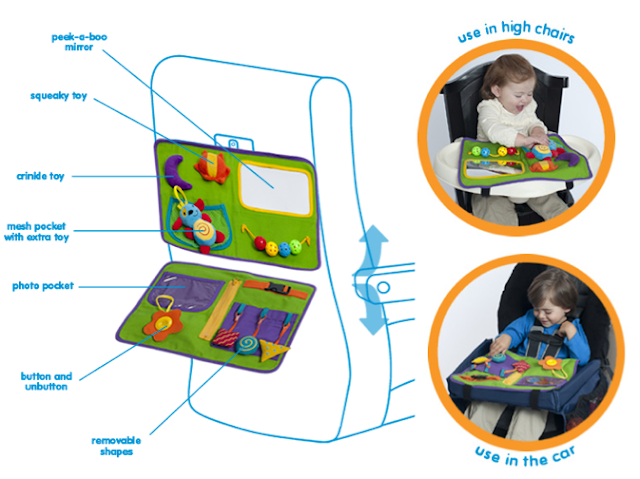 I saw this item, the Play-n-Go Tray Table Cover and thought it was a great idea. 'Though, I'd hate to be the passenger in front the child using this, especially since some parents have no control of their littles ones, and may not tell them to be considerate of the person in the seat in front of them as they play. Vicks VapoRub - Vicks® VapoRub® topical ointment—the #1-selling branded children’s cough cold product* appropriate for ages two and up—is a topical cough medicine with medicated vapors that works quickly for adults as well to relieve cough symptoms, and is not likely to cause drowsiness or jittery side effects, when used as directed. It is available in two scents: Regular and Lemon. Vicks BabyRub - Vicks® BabyRub is a non-medicated formula that contains soothing aloe vera and fragrances of eucalyptus, rosemary, and lavender. Combined with your loving touch, it is perfect to calm, soothe, and relax your baby. It can be used on babies 3 months and older. The Sweet 7: I use(d) this on both my children, once they sneeze, cough. Reminds me of when I hated it as a child, but I remember my mom's soft touch. So I apply to their throat, chest and back and cover them up overnight. 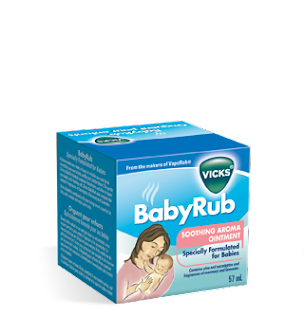 There is Vicks BabyRub which is not as strong as the original and has a nicer scent. 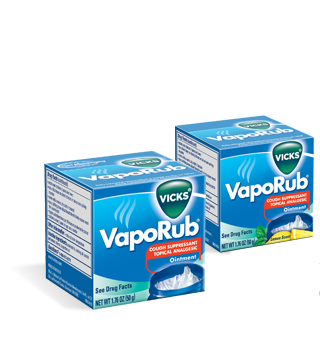 If you can't find the Vicks BabyRub, simply mix the original Vicks with some vaseline and apply to baby. 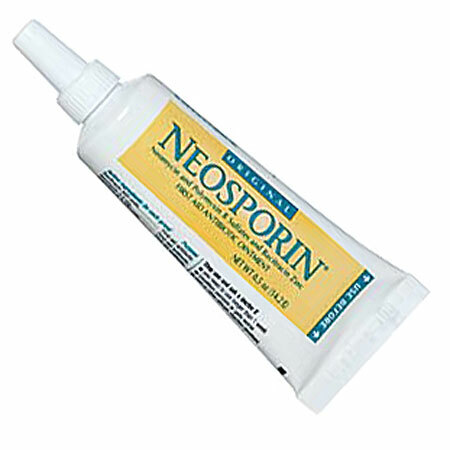 Neosporin - NEOSPORIN® First Aid Antibiotic provides long-lasting infection protection. NEOSPORIN® First Aid Antibiotic kills more types of infectious bacteria in laboratory tests than even the leading topical prescription antibiotic. PLUS, NEOSPORIN® First Aid Antibiotic and a bandage help heal minor wounds four days faster than a bandage alone, and NEOSPORIN® First Aid Antibiotic may help minimize the appearance of scars. The Sweet 7: My mom used this when I was child and I believe in it for my own children. Scratches, cuts, it's the same line, "let's put some neosporin!" Wonderful too, cause it does not sting and heals. As an adult, use it when you have a 'ripe' pimple. It dries it up nicely. 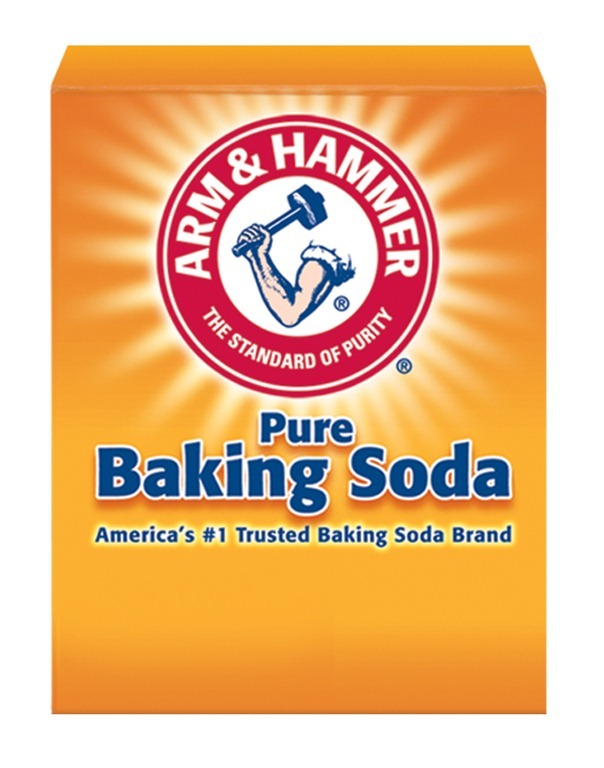 Arm & Hammer Baking Soda - Sure, you know our little orange box. 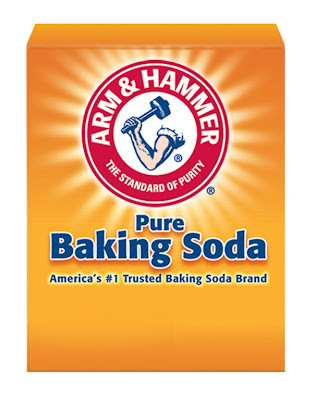 But did you know that for more than 165 years, people have chosen pure, versatile, effective, safe, and affordable ARM & HAMMER® Baking Soda for baking, household, and personal care uses. With countless uses for about $1, no other product does more throughout your home. The Sweet 7: Living in the tropics, the Caribbean, with mosquitoes, I have learnt this thanks to my mom who noticed that my daughter used to get eaten by mosquitoes. Make a paste of baking soda and water. Apply to mosquito bite, to prevent the baby/ child from scratching. This paste soothes the itching sensation and alleviates the bite. As an adult ... it is a great facial scrub. Use it to clean silver. My daughter recently brought this toy to me and asked me to remove the tag. I asked "Who gave this to you?" She of course said, "Granny and grandpa when last they were here." 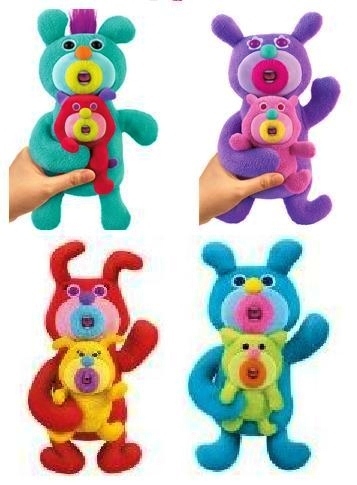 For about 5 minutes after, I played with the Mattel Sing-a-ma-jigs Duet plush toy. It's just too cute! See the video. ... And I have one more product but it deserves its own post! Also I will share my tips for older kids which cost nothing and make a world of difference. Love this post on The Sweet 7, Ny. Used many of these myself, especially the Vicks Vapor Rub... Hahaha you know that's our St. Lucian upbringing. Regarding feeding time, people here were so amazed that I made most of my baby food fresh. My reaction... What's the big whoop? Our Moms always made us fresh food in St. Lucia growing up... Why can't I do the same when I have more resources to make it easier. That little gadget is amazing. No Gerber at my house... Lol. Also used the travel bed/ beach tent. Great post!!! 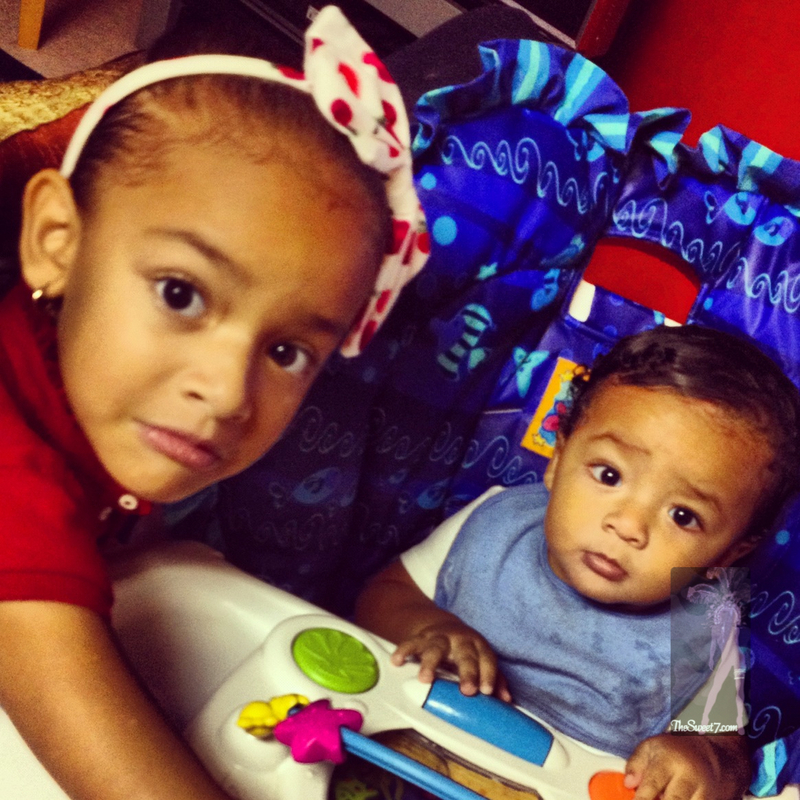 Hi Nyree, I just finished reading your post on the 'fav baby products' and I love it! I'm 32 and yet. I'm yet to be a mom and this is definitely very helpful tips that I can sure use in the future! Keep up the great work and thanks for sharing!